Second City is gearing up for this year's 24-hour "Letters to Santa" fundraiser kicking off on Tuesday, December 14 at 7 p.m., and has revealed a very solid initial music lineup for the event. 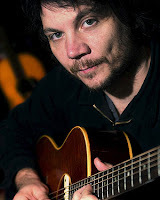 So far, Wilco frontman Jeff Tweedy, JC Brooks and the Uptown Sound, Steve Albini, Robbie Fulks, The Blisters, Bill Callahan and Danielson Famile are scheduled to perform. In addition to the musical appearances, both current Second City cast members and alumni will provide comedy throughout the benefit. Proceeds will go toward helping local families in need. Tickets cost $15 dollars and will only be available at Second City (1608 N Wells St) starting at 6 p.m. on December 14. Letters to Santa is an all-ages event.